AWT Wild Schools blog: Avon Wildlife Safari Day 31 - Find a fiddledock! Brandon Hill is one of my favourite spots in Bristol. Maybe because it's right next to my office so I have enjoyed some lovely picnic lunches on the grass in the sunshine. 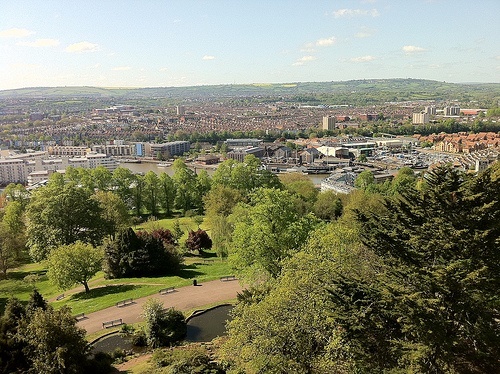 Possibly it's because of the phenomenal views across Bristol from the benches near the top, where you can see the SS Great Britain, the river flowing through the city and the rolling hills of Ashton Court. It could even be the fantastic treats sold by Vee Double Moo the lovely vintage VW ice cream van that can be found near the tower. In fact there are many reasons to go and explore this park. In 1980, Avon Wildlife Trust was formed and pioneered urban conservation, developing a wildflower meadow in Brandon Hill park to create an urban nature reserve. The wildflower meadow is full of cowslips in spring but is at its best in midsummer, when ox-eye daisies, yellow rattle and knapweed add a fine splash of colour. The rocky outcrop is home to some unusual plant such as stag’s horn plantain, knotted hedge parsley and spotted medick. Look out also for the fiddledock, shaped like a violin, which grows around the hill. A pond provides a breeding site for frogs, toads and smooth newts. Along the attractive woodland walk, birds such as jay, bullfinch and blackcap may be seen. Take an early morning wander through the woodland to hear chaffinch, song thrush, chiff-chaff and more besides. You will, no doubt, notice the abundant squirrels that scamper around Brandon Hill. They were introduced onto Brandon Hill in the late 19th century (after 30 attempts) and are now thriving in the park. The Wildlife Trust office is just situated at the foot of the steps that lead onto Jacobs Wells Road. The wall outside is a great place to spot an eight legged invader from the docks. The funnel web of the Mediterranean wall spiders that have set up home in the city can be seen in small holes in the wall. These spiders are thought to have come in on boats from the docks and can be found across the South of England around ports.